I was happily surprised to read an email from an American performer who was visiting London for a few days and wanted a photo shoot. The email was from Pixie Danger, Dancer/Performer/Puppeteer/Model who hails from Nashville. We emailed back an fourth and Pixie commented that she ‘likes to do weird stuff kind of inspired by the location’. Yes, I had a weird place in mind. 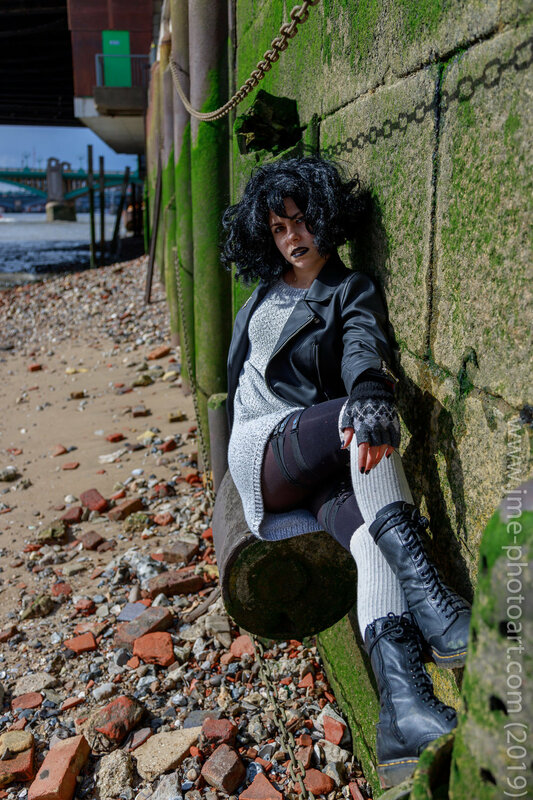 I decided to return to a location on the North bank of the Thames when the tide was out. I had used the location before. However…. once I had met up with Pixie and Jonesy (?) think I have that right, we walked and talked till we arrived at the location. Only to find that the tide wasn’t quite as far out as I would have liked. Ahh well lets keep going anyway. 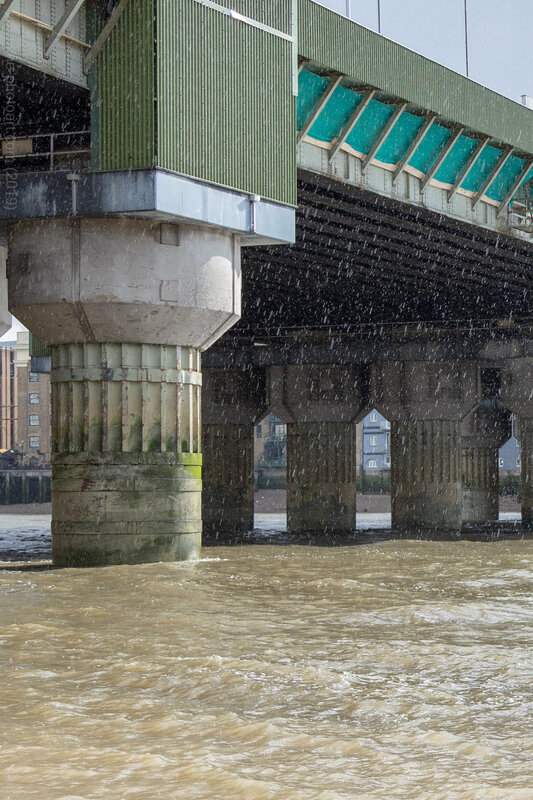 We descended to the shore and moved under Cannon Street bridge where we were in less danger of being swept into the Thames. I had Jonesy on guard duty to make sure none of the passing boats would create a swell big enough to disrupt our shoot ( he was also a good stage kitten for our bags too!). Pixie lived up to her name by immediately scaling the wall and reclining on old pipes and holding on to chains. Even a rusty piece of metal was used as a balance beam by the shores edge. With Jonesy pushing the waters edge back we made our way towards the rusted barge which lies close to the stairs. The water line was close to the edge of the barge but we could get to the other side without the need for life jackets. I am glad we did as I was going to suggest leaving this location for another but if I had then we would not have got this incredible shot below. The front of the barge is sloped so the danger sense kicked in and I asked Pixie to crawl underneath for this shot. Just look at those eyes! It was at this point that our meteorologist, Jonesy informed us it had started raining. Grabbing my bag I noticed that it wasn’t rain but hail that was hitting my bag. So for a while we crouched under the barge for safety. Our next destination was across the bridge and back down on to the south shore of the Thames. Thankfully the tide had gone further out by now so we had more room to move around. We walked along to arrive under the Millennium Bridge. If anyone asked me which is my favorite shot is then it is this one. This looks like the front of an album or book cover! We then moved further down the bank towards an over hang where Pixie once again threw caution to the wind and started to swing from a old chain. I had no idea how old the chain was so I too threw caution to the bottom of the Thames and started taking photos. I also had no idea Pixie had been wearing a wig all this time… NONE AT ALL. After this I called the end of the shoot and we parted ways. I walked up to Cannon Street main line station and sat down to review the shots while I waited for my train. Then I got hit on the back of the head with more hail. The quick hail shower before was just a taster! Hope you were under cover! No swans were stalked in the making of this photo! 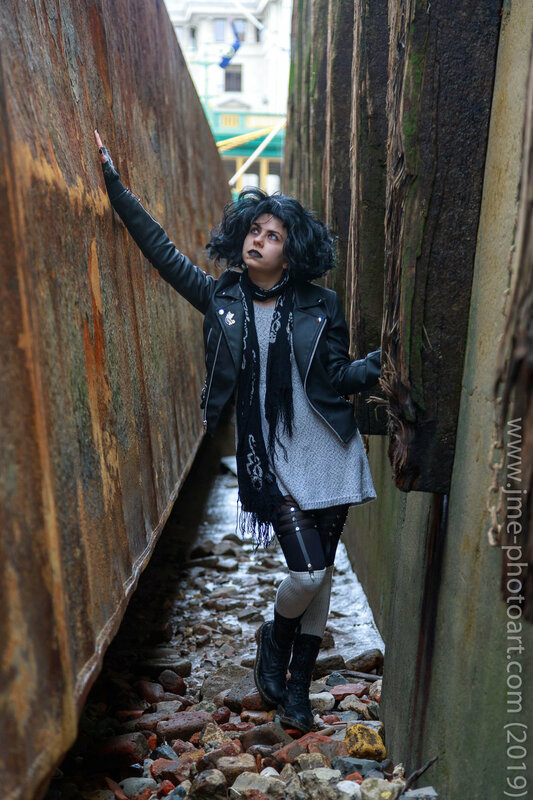 Pixie Danger is a Dancer/Performer/Puppeteer/Model from Nashville.